Can be attached to an arbitrary shape to compute exitant radiance due to internal scattering. How that is done is completely up to the implementation. It might for instance recursively trace rays or perform lookups into a precomputed point cloud radiance representation. Create a new subsurface scattering class. 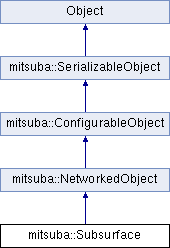 Unserialize a subsurface integrator from a binary data stream. Cancel any running pre-process tasks. Return the list of shapes associated with this subsurface integrator. Return whether or not the subsurface integrator is currently active. Get the exitant radiance for a point on the surface. Possibly perform a pre-process task. The last three parameters are resource IDs of the associated scene, camera and sample generator, which have been made available to all local and remote workers. Serialize this subsurface integrator to a binary data stream. Selectively activate/deactivate the subsurface integrator. Set the parent node of the subsurface integrator.